A project by Rachel Binx. Meshu allows anyone to mark meaningful locations to them and creates a beautiful piece of unique jewelry from this data. Created by Laurie Frick. Looks at activities over the course of a day as data and visualizes it as large scale art. This project makes art out of mundane data. 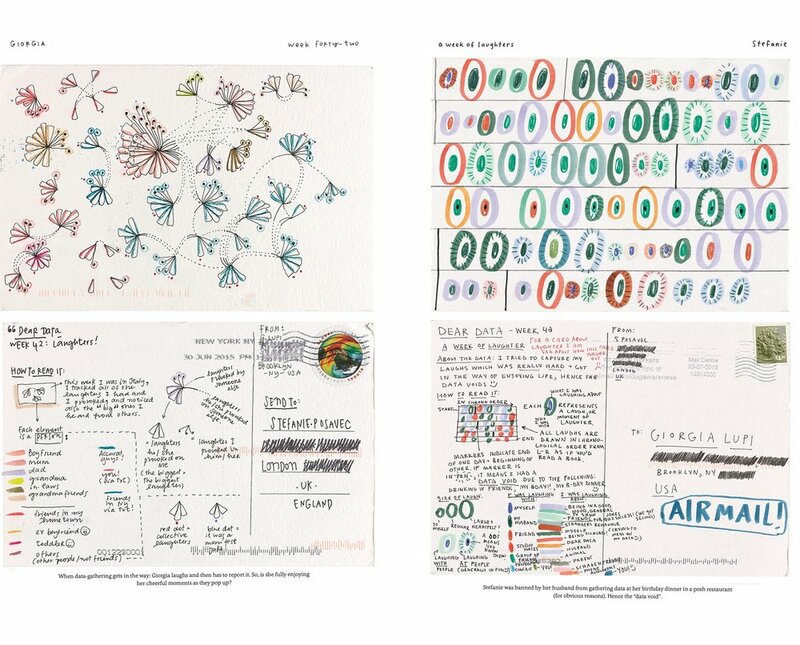 Collaboration between Giorgia Lupi and Stefanie Posavec intended as a project to get to know each other better by hand drawing postcards using data collected from their daily lives. Started by Ryder Carroll as a way to catalog monthly and daily agendas, to-do lists, and as a sketchbook, notebook, and diary. It has evolved into much more like a habit and mood tracker. This growing trend with the peak being books by Johanna Basford highlights a return to a physical activity to help with stress and mindfulness. With the popularity of devices like Fitbit and Leaf there's more access to personal data. However adding an annotated layer like the events of your marriage proposal to your heart rate data make the information more meaningful. A New York Times piece that asks the user to form opinions about the data before the graph is revealed. The reader is actively engaged in the exercise, rather than just being show the data. A popular online activity. By answering a few questions, users discover something more about themselves, like what their Harry Potter spirit animal is, in a fun shareable way.